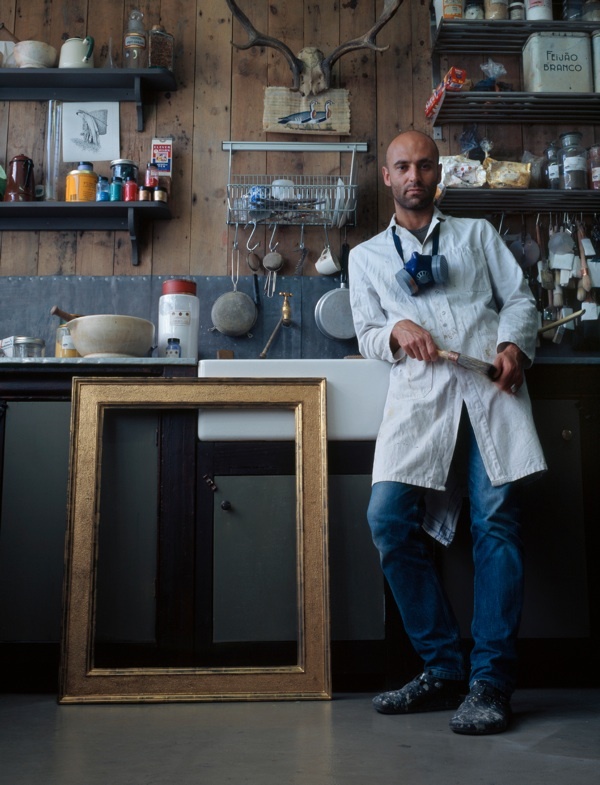 Pedro da Costa Felgueiras will tell you that he is a lacquer and paint specialist, or japanner – but I think he is an alchemist. 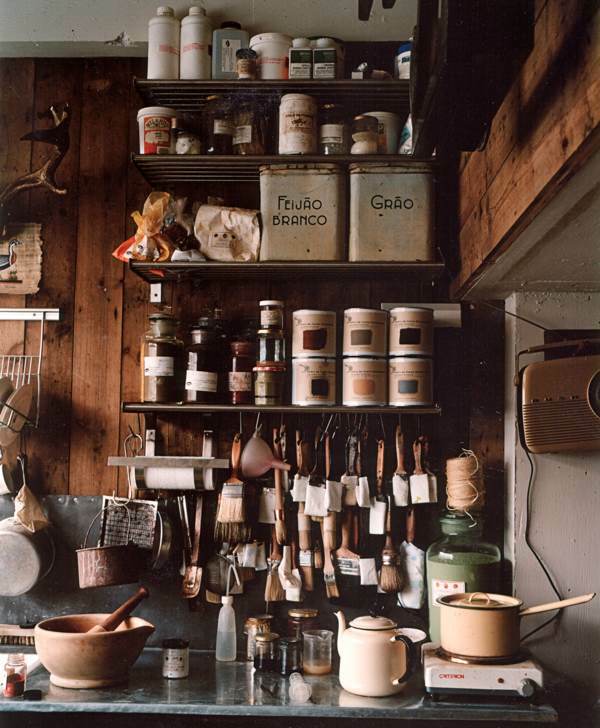 In his secret workshop in a Hoxton backstreet, Pedro has so many old glass jars filled with mysterious coloured substances, all immaculately arranged, and such a diverse array of brushes, that you know everything has its purpose and its method. Yet even as Pedro begins to explain, you realise that he is party to an arcane universe of knowledge which defies the limits of any interview. Pedro showed me Cochineal, the lush red pigment made from crushed beetles – very expensive at present due to the floods in Asia. Pedro showed me Shellac, which is created by the Kerria lacca beetle as a coating to protect its eggs and, once harvested, is melted down and stretched out in huge transparent sheets like caramel – and is commonly used to make chocolate bars shiny. 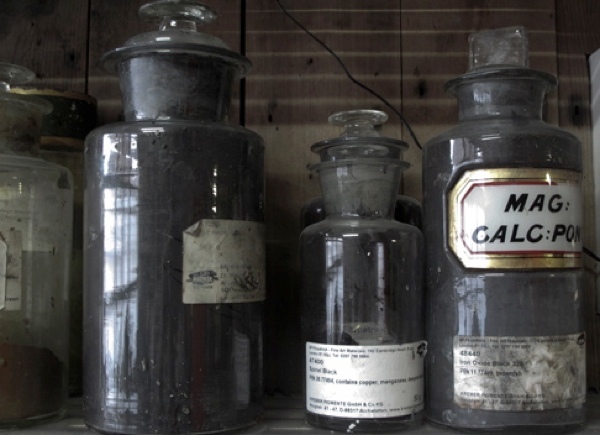 Pedro showed me Caput Mortuum, a subdued purple first produced by grinding up Egyptian mummies – Whistler was so horrified when he discovered the origin that he buried the paintings in which he used this pigment in his back garden. Pedro showed me his broad Japanese lacquer brush, of the kind made from the hair of pearl divers, selected as the finest and densest fibre. Pedro showed me his fine Japanese lacquer brush made from the tail of a rat, as he delighted to explain, once he had put it in his mouth to wet it. “When I first came to Spitalfields I used to walk around and look at the old houses, and now I have ended up working in many of them.” he continued, thinking back, “In London, I was fascinated by the junk markets and I bought things, and I wanted to restore them – it all came from that.” Pedro undertook a B Sc in restoration and was inspired by the work of Margaret Balardi who inducted him into the elaborate culture of japanning. “The first thing she taught me was how to wash my brush,” Pedro recalled with a grin. “In the eighteenth century when they imported lacquer ware from the East, they started imitating it and used European techniques to do it. At first, they imported the ingredients from Japan but they couldn’t do it here and people died of it because it is poisonous,” Pedro explained, adding that he studied lacquer work in Japan and can do both Eastern and European styles. “I keep everything clean and I don’t touch it,” he assured me. In the centre of the workshop was a fine eighteenth century lacquered case for a grandfather clock that had been cut down for a cottage when it went out of fashion in the nineteenth century. Pedro was painting the newly-made base and top, using the same paints as the original and adding decoration from an old pattern book. To reveal the finish, he wiped a damp swab across the old japanning and it instantly glowed with its true colour, as it will do again when he applies a new coat of shellac to unify the old and the new. 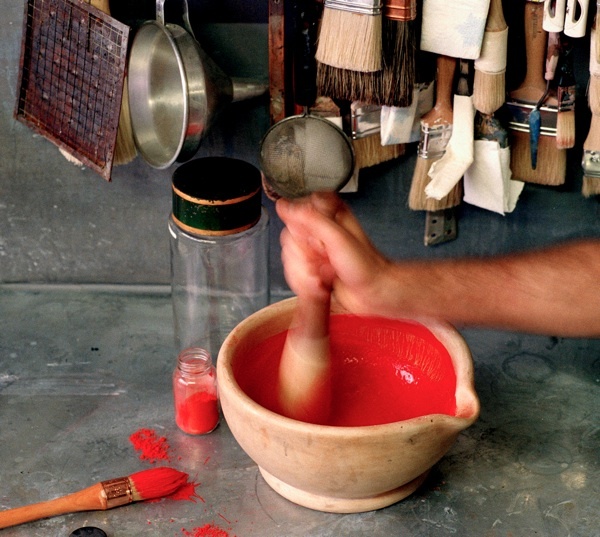 Using old manuals, Pedro taught himself to mix pigments and blend them with a medium, and now his talent and expertise are in demand at the highest level to work with architects and designers, creating paint that is unique for each commission. 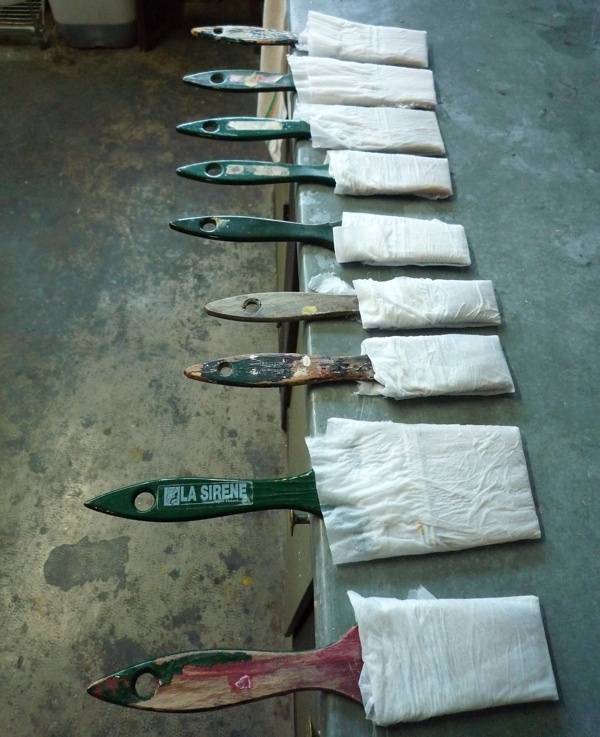 In the eighteenth century, every house had a book which recorded the paint colours used in the property and Pedro brought some of these out to show me that he makes for his customers today, with samples of the colours that he contrived to suit. There is a tangible magic to these natural pigments which possess a presence, a depth, a subtlety, and a texture all their own. 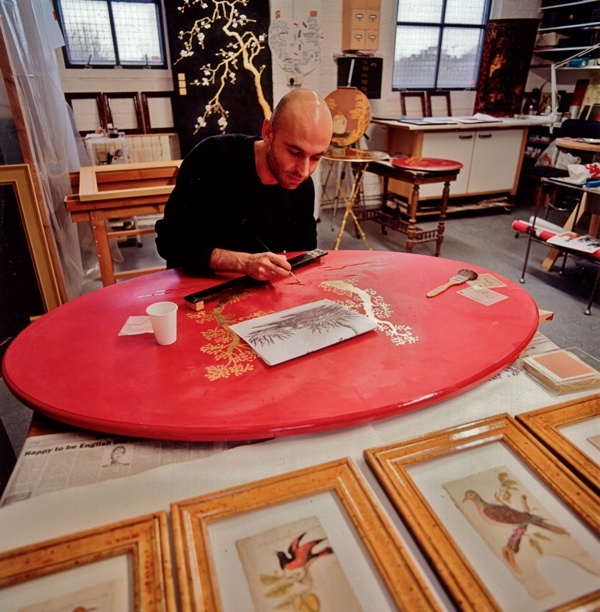 Pedro paints a lacquer table to a design by Marianna Kennedy. Another marvellous post. What an education you give us! I too think Pedro is really an alchemist – perhaps his alembic is in the washing-up sink? 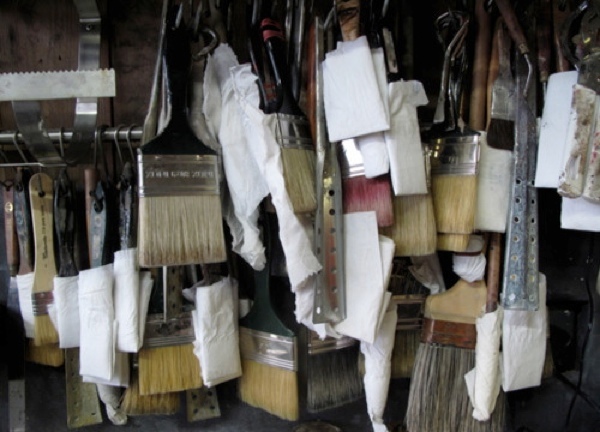 Beautiful shots of his brushes. I wonder what the ball of twine gets used for. I’m happy to hear that this became a job- it’s nice to know the old methods have new life.